Einstein assumed that the concepts and conventions of matter and the material concepts of relativity could be applied to the velocity of light. He even used strained logic in a failed attempt to rationalize their compatibility. However, such application only contributed to Einstein’s confusion concerning the velocity of light and helped to cause the “difficulties” that he imagined. In the end, it becomes obvious that material bodies and rays of light are such different phenomena, that any convention of matter and any version of Galileo’s Relativity are irrelevant to light. The two concepts (matter/relativity and the velocity of light) are not compatible and can never be reconciled. A. Should the concepts and conventions of matter and mechanics be applied to the velocity of light? The short answer is no. First of all, the phenomena of material bodies and their motions are completely different from the phenomena of light and its constant transmission velocity of c. Material bodies have mass, whereas light photons theoretically have no mass (Griffiths, p. 513). Rigid bodies are composed of atoms, which form ponderable matter, whereas light is composed of waves and/or massless particles of radiation (photons). Wave trains of light particles are not really three dimensional, whereas ponderable material objects are. Light, being non-material, has nothing to do with the material phenomena of inertia, lateral inertia and inertial motion. The concepts of lateral inertial motion and inertial frames of reference only apply to material bodies. For example, light always propagates through any reference frame (with inertial, accelerated, arbitrary, orbital or any other motion) in exactly the same manner (rectilinearly and at the same transmission velocity) (Figures 23.1 and 24.1). Also, unlike inertial frames, light is never relatively at rest; in fact, any form of rest is strictly a material concept. Nor does light provide inertial resistance to a force attempting to change its constant state of motion (transmission). Light does not adopt the same common inertial motion or lateral uniform velocity as its material source. In fact, “motion” in any form is also only a material concept. Light has nothing to do with material reference frames, inertial, accelerated, arbitrary or otherwise (Figures 23.1 and 24.2). Reference frames were a priori created only to describe, locate, measure and relate the relative positions and motions of material rigid bodies in space (Einstein, Relativity, pp. 6 – 11; Chapter 13). This cannot be done with non-material light. Where is light’s point of emission in space? Unlike material bodies and their motions, we can never know (Chapter 22B). If reference frames are irrelevant to light, it follows that transformation equations (of any kind) between reference frames are also irrelevant to light. Similarly, the constant transmission velocity of light at c has nothing to do with forces, accelerations, masses, resistance, the momentum of material objects (mv), nor the motions of material objects in such inertial frames. All of the above phenomena of material bodies are irrelevant to electromagnetic waves propagating through space and the constant transmission velocity of light at c.
Also, unlike the constant transmission velocity of light at c, the laws of material bodies and mechanics (i.e. mass, force, acceleration, resistance, momentum, etc.) do not include an instantaneous, built-in and inherent specific constant velocity. The velocities of all material bodies depend upon the above laws of mechanics and other material variables, such as gravity and curved trajectories, and normally such velocities of matter are very different from one another. On the other hand, the phenomenon of light does include an inherent built-in, specific, constant, and instantaneous velocity. The constant transmission velocity of light at c through empty space is an inherent property of the phenomenon of light en vacuo, and as such it is always the same and never changes. Thus, it was a substantial false premise for Einstein to automatically assume and conjecture that a propagating ray of light and a moving material body should be treated as equivalents, and that Galileo’s Relativity in any form should apply to and govern both phenomena. 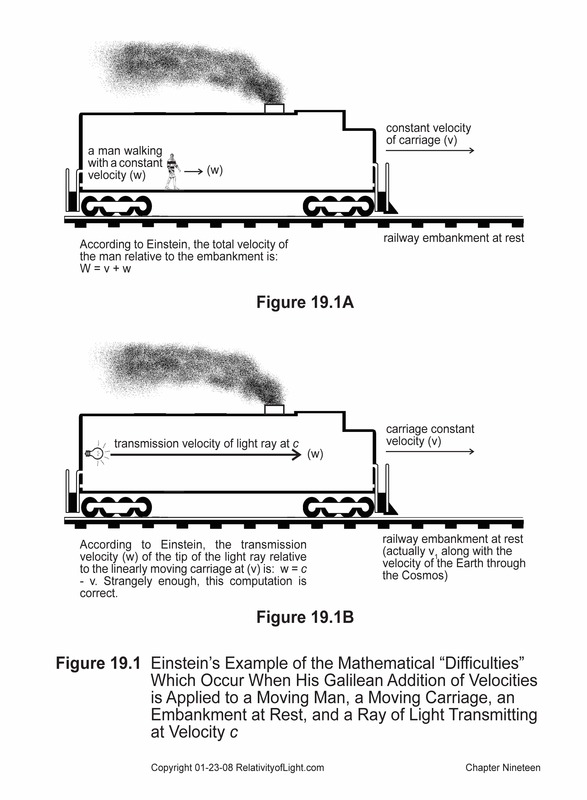 His attempted analogy of such equivalence, vis., that “the ray of light plays the part of the man walking along relatively to the carriage” (Einstein, Relativity, p. 22), was invalid on its face for many reasons (Chapter 19). The two scenarios, a walking material man and a propagating ray of light, exemplify extraordinarily different phenomena. There are material relationships between the man and the carriage, such as mass, force, friction (resistance), acceleration, inertia, common velocity, material momentum, and motions of material objects. However, there is no material relationship whatsoever between the light ray and the carriage. The only thing similar about the walking man (a uniformly moving material system) and the tip of a propagating light ray is that they are both uniformly changing their relative positions at a constant rate, albeit at very different speeds. As a further example of such non-equivalence, the front of the carriage is physically stationary relative to the walking man, so that the constant velocity of the man relative to it is always “w.” No matter how fast the carriage is moving relative to the embankment, the constantly walking man would a priori always reach the front of the carriage at velocity “w” in the same interval of time (Figure 19.1A). On the other hand, the front of the carriage is not physically stationary relative to the non-material light ray transmitting at c, so the constant transmission velocity of the tip of the light ray relative to it is always c – v. If the carriage could somehow also be inertially moving at c, then the light ray propagating at c – c relative to the front of the carriage would never reach it during any interval of time (Figure 19.1B). When material bodies are accelerated, their accelerated motions are compared in different inertial reference frames with different relative velocities, and the invariant laws of mechanics will always work algebraically in the same way (covariantly) on each body. But the different constant velocities of each different inertial frame, and any Galilean addition of velocities’ in order to describe relative positions (vt) of such frames, are irrelevant to how the laws of mechanics algebraically work in such equivalent inertial frames (Chapter 14). On the other hand, the inherent property of the constant transmission velocity of light at c is never irrelevant to the phenomenon of light, nor to how light propagates through space or relative to linearly moving material bodies. The Cartesian coordinate systems for material bodies are also irrelevant to the velocity of light. Measuring the velocity of a ray of light on a Cartesian coordinate system was purely a fiction. No one has actually physically accomplished this impossible feat. The only part of a light ray that could even theoretically be placed on coordinates would be the front tip of the light ray. How, where, and on which coordinates would one plot such tip if one could see it? Where is such tip’s point of emission in space from which to describe or measure it? It must always remain uncertain (Chapter 22B). If one were attempting to translate the point of such tip to a distant coordinate system it would, of course, be located on a corresponding single coordinate. What purpose would this serve? The distant observer could not even perceive the light ray or attempt to plot it or measure it until it arrived. This translational plotting could not even tell such observer the light ray’s velocity propagating through that frame. Such observer could only infer that when the tip of such light ray got there that it had propagated an arbitrary distance of ct ± vt during an arbitrary time interval. For all of the above reasons, these two very different phenomena—an inertially moving material body and a light ray constantly transmitting at velocity c—are not equivalent, compatible nor even reconcilable. There is no correlation, commonality, nor compatibility between them, whatsoever, except that they both exhibit uniform rectilinear velocities. B. Should Galileo’s material concept of relativity be applied to the constant velocity of light? Again, the short answer is no. First, the critical criteria for Galileo’s Relativity in any form are all missing when it is applied to the phenomena of light and its velocity c. Light is obviously not an inertially moving body upon which to apply Newton’s second law of acceleration. Nor does light sense the uniform motion of any inertially moving body as being equivalent. Nor is light (uniformly transmitting at c) an application of Newton’s second law, because no force is being applied to light and light does not accelerate relative to an inertially moving frame. Without some form of applied force and resulting acceleration relative to equivalent inertial motions, the fundamental criteria for Galileo’s Relativity in any form are totally missing. Second, the constant uniform transmission velocity of light at c is also totally irreconcilable and incompatible with Galileo’s Relativity because Galileo’s Relativity only empirically dealt with mechanical covariance and invariance. By definition light en vacuo is a constant and invariant quantity, and invariant quantities by definition cannot be algebraically transformed or changed in the same sense as variable quantities in Newton’s second law (F = ma) are mechanically covariant. According to Maxwell’s equations, the constant transmission velocity of light at c relative to its medium of ether (empty space) was both an inherent property of light as well as an invariant quantity that could neither change at any time nor in any different reference frame. In other words, by definition both the law and the magnitude of the transmission velocity of light at c are invariant; they do not vary, period. If velocity c is empirically and by definition constant and invariant, this means that its constant magnitude cannot meaningfully be algebraically transformed or translated from one inertial reference frame to another, in the same sense as mechanical covariance. If a translation is attempted the mathematical result will be c ± v (a relative velocity). Only variable or mechanically covariant quantities, such as force and acceleration, can meaningfully be algebraically transformed or changed from one inertial reference frame to another, in order to demonstrate that the law that applies to them (Newton’s second law) will always remain invariant. Maxwell’s law for the constant transmission of light at c is already invariant, but Galileo’s Relativity cannot demonstrate this invariance. So what relevance does Galileo’s Relativity have for an invariant light ray at velocity c? None. This conclusion was also true for the two different inertial velocities of the co-moving material reference frames in Galileo’s Relativity (i.e. the uniformly moving Earth at velocity v1 and the uniformly moving ship at velocity v2). Because the magnitudes of their velocities were empirically inertial, uniform and constant, such inertial velocities could not meaningfully be algebraically transformed or changed by a Galilean transformation (translation) equation (or any other transformation equation) from one inertial reference frame to another (Chapter 14). If this one-to-one translational transformation was attempted the mathematical result would be v1 ± v2 = v3 (a relative velocity), which would be totally irrelevant and meaningless to Galileo’s Relativity. For similar reasons, the Galilean transformation equations were also irrelevant and meaningless with respect to such constant and invariant inertial velocities. Likewise, the Galilean “translation” equations were also irrelevant to the constant and invariant transmission velocity of a light ray at c. They were not only irrelevant, but it was physically and conceptually impossible for any such translation equations to algebraically turn the constant, empirical and invariant magnitude of the transmission velocity of light at c into a different (mechanically covariant) quantity. Again, this irrelevant misapplication by Einstein of the Galilean translation equations to the empirical and invariant quantity of c only resulted in mathematically producing relative propagation velocities of the light ray (i.e. c – v and c + v) vis-à-vis material objects linearly moving at velocity v in different directions (Chapter 14). Such relative propagation velocities for light could satisfy no purpose within the meaning of Galileo’s Relativity. They were irrelevant and meaningless to Galileo’s Relativity. However, they did serve to confuse Einstein and the scientific community. Nor was there any reason for Einstein to supplant such irrelevant Galilean translation equations with the equally irrelevant Lorentz transformation equations, in order to mathematically eliminate such very natural relative propagation velocities (c ± v) of a light ray. The Lorentz transformation equations are just as irrelevant to the velocity of light as the Galilean translation equations were. Neither transformation can logically, physically or empirically change an invariant quantity…such as a constant inertial velocity or the constant transmission velocity of light at c. The only change that occurred with the misapplication of the Lorentz transformation to light was to artificially change a relative velocity (c ± v) into an absolute velocity (velocity c relative to everything, anywhere) (Chapter 27). Third, a true mechanically covariant experiment could only occur where there are different acceleration events with different magnitudes for their mechanical variables (F, m and a) in two different inertial frames of reference in order to demonstrate to an observer in each inertial reference frame that each different acceleration was mechanically covariant (empirically and physically the same) with respect to Newton’s second law. 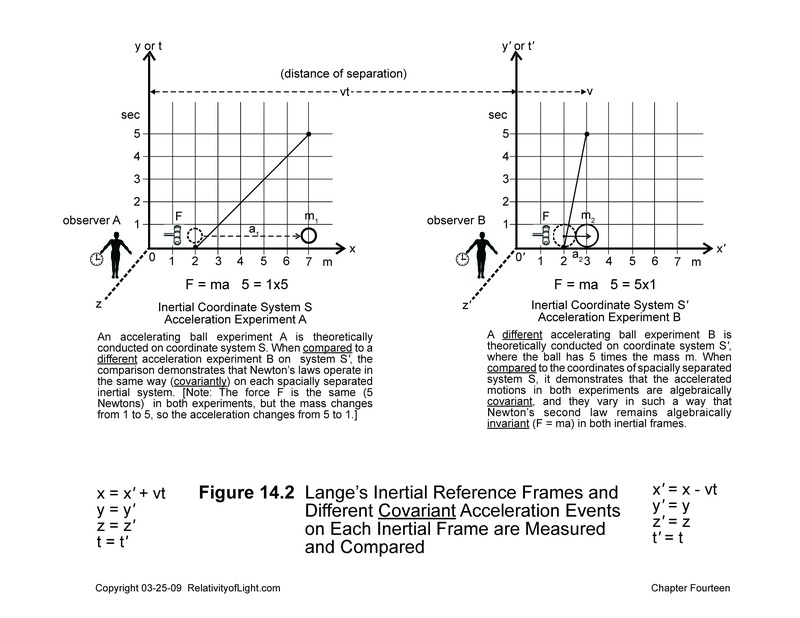 In other words, there was a comparison of two acceleration experiments. This is what happened empirically in Galileo’s Relativity. There were different acceleration events with different magnitudes for mechanical variables in port and on the uniformly moving ship, but empirically their motions appeared to exemplify the same law of motion (Newton’s second law) (Figures 5.1A and 5.1C). On the other hand, with Lange’s abstract version of Galileo’s Relativity there was only one acceleration event at one position in one reference frame, which was being translated (transferred or shifted) by one-to-one transformation equations from one inertial reference frame to another (Chapter 13). 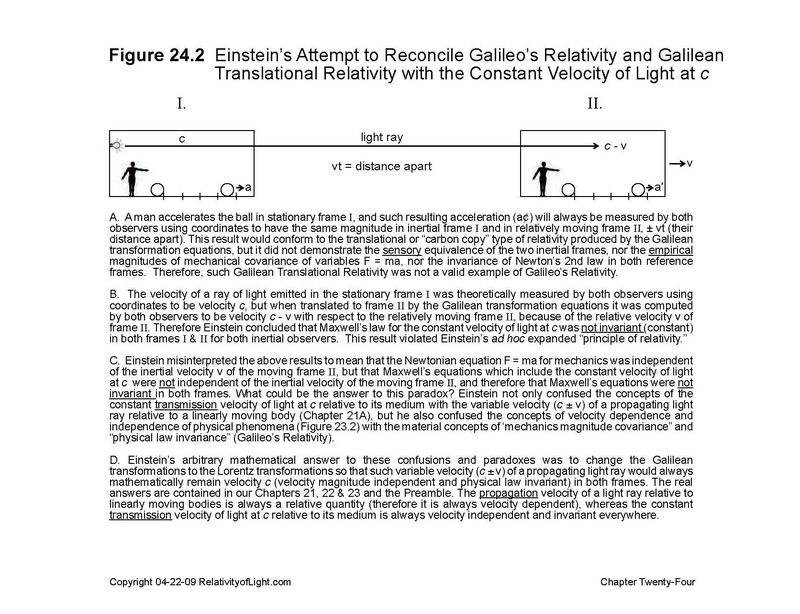 Even Einstein acknowledged this “uniform translatory motion” (Einstein, Relativity , pp. 15 – 16). Therefore, all coordinate points for one acceleration in one reference frame were merely translated (transferred or shifted) to the other reference frame. There never was a comparison of two experiments. There never were different magnitudes for any mechanical variables that could demonstrate either the algebraic mechanical covariance of such magnitudes, nor the invariance of a physical law in each spatially separated inertial reference frame. For all of the above reasons, neither Lange’s abstract model of Galileo’s Relativity nor the Galilean transformation (translation) equations ever satisfied the major purpose of Galileo’s Relativity: the empirical demonstration that mechanically covariant magnitudes on spatially separated bodies (frames) resulted in the invariance of a physical law. 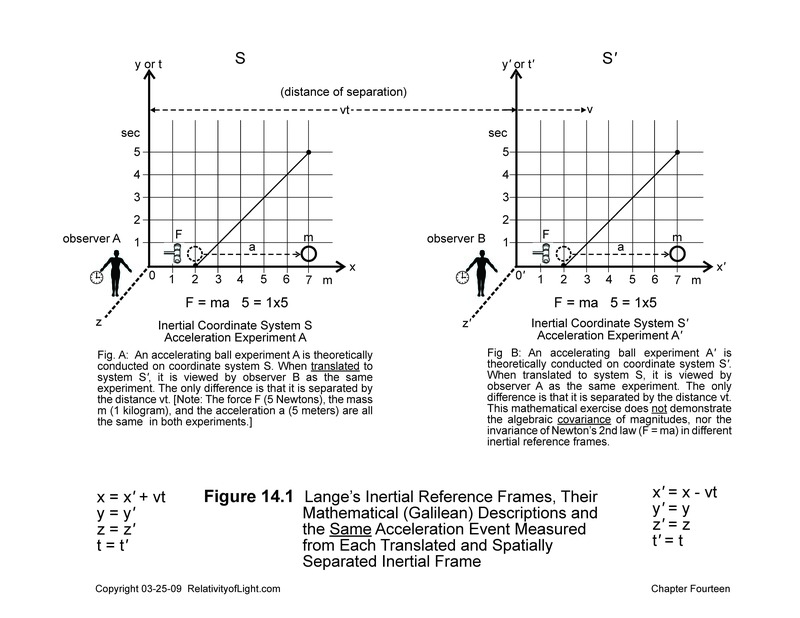 Thus, both Lange’s abstract version of Galileo’s Relativity and the Galilean transformation (translation) equations were completely meaningless and irrelevant with regard to Galileo’s Relativity (compare Figures 14.1 and 14.2; see Figures 23.1 and 24.1A). If Lange’s inertial frames of reference and the Galilean transformation equations were both meaningless with regard to Galileo’s Relativity, why then did Einstein: 1) adopt both of such abstract mathematical concepts for his Special Theory, 2) change the Galilean “translation” equations into the equally meaningless Lorentz transformation equations, 3) represent to the world that his entirely new ad hoc concept was merely a generalization of the classical and empirical concept of Galileo’s Relativity…and 4) misrepresent that he had just theoretically extended the application of Galileo’s Relativity to electrodynamics and optics? The answer is, because this was the only way that Einstein could hope to make his Special Theory appear to have an empirical foundation, and because he needed the inertial reference frames of Galileo’s Relativity and its related Galilean transformations (with relative velocities and coordinate measurements) in order to construct his Special Theory. However, as we shall see in Chapter 24, Einstein completely deviated from Galileo’s Relativity in order to construct his Special Theory. He laboriously used strained logic and false analogies in a failed attempt to rationalize the compatibility of Galileo’s Relativity (in its various forms) with the velocity of light (Chapter 24B). But, in the end, it becomes obvious that material bodies and rays of light are such different phenomena that any convention of matter and any version of Galileo’s Relativity are completely irrelevant to the phenomena of light. Again, the two concepts (matter and light) can never be reconciled. The “difficulties” with the velocity of light that the scientific community had created for itself by 1905 was not just one paradox, but rather an entire family of paradoxes. Apparently, it has never been fully realized that a primary cause of all of these paradoxes was the misapplication of various material concepts and conventions to non-material radiation (light), and/or the misinterpretation of the results of such misapplications. We shall now briefly describe several of these material concepts and conventions and how they were misapplied, misinterpreted and/or strangely not applied. 1. The Medium. In the classical physics of the late 19th century, every material body was thought to move through (or relative to) a material medium, such as air, water, glass, or the fictitious material substance called ether that theoretically filled all of space. By convention, every medium had to be “material.” For example, Maxwell misdescribed the phenomena of light as a disturbance of the hypothetical material medium of ether, and he theorized that such disturbance transmitted relative to (or through) this stationary medium of ether at a constant velocity of c (300,000 km/s) (Chapter 6A). It was finally realized and stated by Michelson (in 1881), and implied by Einstein (in 1905), that the concept of material ether was an invalid concept—a myth—and that it did not exist. Nevertheless, it was apparently never explicitly realized nor officially accepted that empty space took the place of the non-existent material ether as the non-material medium relative to which the electromagnetic waves of light transmit at the velocity of c, and that Maxwell’s equations should remain valid in this context. Why? Because most mathematical physicists apparently cannot conceive of a “medium” that is not material, and their equations will not work with a constant velocity of something (light) relative to nothing (empty space). Therefore, the perfectly valid empirical concept of a light ray transmitting at the velocity of c relative to its medium of empty space (from a star to Earth) is apparently not mathematically permitted in physics. The author has received many violent objections from mathematical physicists where he has suggested the concept of empty space (a vacuum) as the medium for the transmission of light at c.
For some unfathomable reason, Einstein and the entire scientific community has apparently failed to realize that Maxwell’s theory of light (which is embedded in his equations) asserts that light is transmitted at the constant velocity of c relative to its medium of ether and (in the absence of ether) relative to empty space (a vacuum). Maxwell specifically referred to the velocity c of light relative to the medium of a vacuum (Maxwell’s Papers, Vol. I, pp. 579 – 580). Even Einstein repeatedly refers to the velocity of light as c en vacuo or in empty space (see Einstein, 1905d [Dover, 1952, p. 40]; Einstein, Relativity, pp. 21, 23, 35, 38, 47, 68). Instead, they doggedly keep asserting that Maxwell’s concept of light is transmitted relative to material bodies that are moving inertially and linearly relative to one another. No misapplication of a material concept, and no misinterpretation of a law of physics, is more responsible for the resulting confusion and distortion of physics that is Special Relativity…than these described above. 2. Ether and Confusing Speeds. Material bodies (such as autos, rockets or planets) all move at various different speeds, velocities, accelerations, or arbitrary motions even through empty space. Whereas, a light ray inherently only transmits at the constant rectilinear velocity of c relative to its medium of the vacuum of empty space, as it propagates over various changing distance/time intervals from one linearly moving material body to another at various relative velocities of c ± v. Apparently, it was difficult or impossible for the scientific community to realize or reconcile these very different phenomena. “Elementary reasoning according to Newtonian mechanics requires that if the speed of light is c as measured in a particular reference frame then it cannot also be the same number c relative to a different frame. If the source of the light (a lamp, say) is used as a reference frame then the speed of light should have one value relative to a source at rest and another value relative to a moving source. But that is not the case according to Maxwell’s theory. “How can this be? One seems to be drawn to the conclusion that Maxwell’s theory is valid only relative to one single reference frame! “Maxwell and his contemporaries were aware of that. They pictured light waves as traveling on something. Just as water waves move on water and sound waves move on air, electromagnetic waves move on some medium. That medium was called ether. And c is the speed of light relative to the ether. Therefore, it was argued, Maxwell’s theory is strictly valid only relative to the ether. The ether determines a preferred reference frame” (Ibid). Rohrlich referred to the above paradoxes as “the paradox of the speed of light” and as “a very serious and very basic conceptual problem…which finally led to the development of the special theory of relativity” (Ibid). At first the scientific community attempted to determine the motion of the ether. In order to explain Bradley’s 1728 aberration of starlight experiment, the ether near the Earth must be stationary. 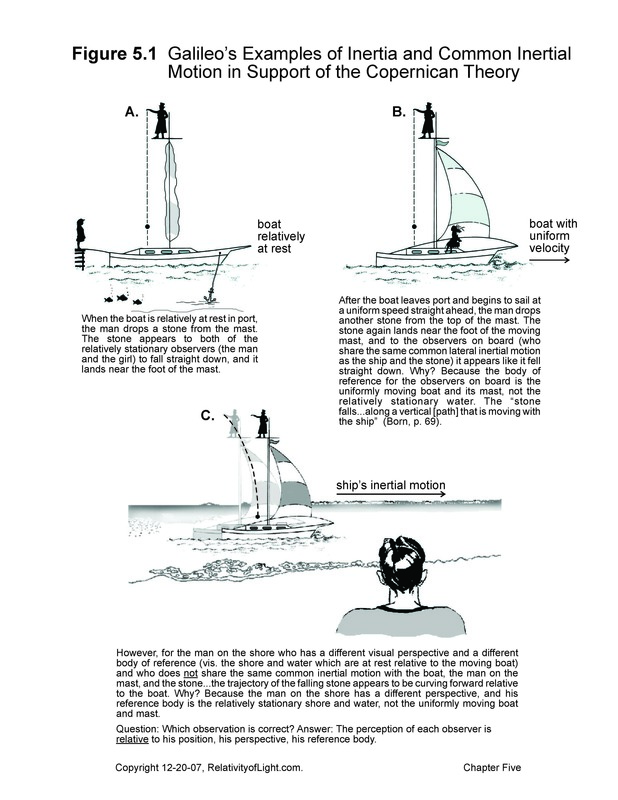 In order to explain Fizeau’s 1851 experiment with light propagating through moving water in different directions, the ether must be partially dragged along by the material moving water (Rohrlich, pp. 52 – 54; Chapter 7). In order to explain the 1887 M & M experiment, the ether must be fully dragged along by the Earth (Rohrlich, p. 54). Because of these conflicting results, it gradually became obvious to some that the ether hypothesis was untenable. But this still left the question: with respect to which reference frame was Maxwell’s velocity of light at c valid (Ibid, pp. 54 – 55)? The correct answer is no reference frame; only the medium of a vacuum. “How can all these experiments agree with a theory that gives the same speed of light [velocity c] relative to all these reference frames” (Ibid). What could be the answer to this paradox? The answer is again: the transmission velocity of a light ray is c relative to its medium of empty space (a vacuum), but relative to different linearly moving material bodies (frames of reference) the light ray propagates over changing distance/time intervals at various relative velocities. The experimenters who made such observations were all measuring the constant transmission velocity of a light ray to and fro over a finite distance/time interval. They were not measuring the variable velocity of a light ray propagating relative to their linearly moving material frames. 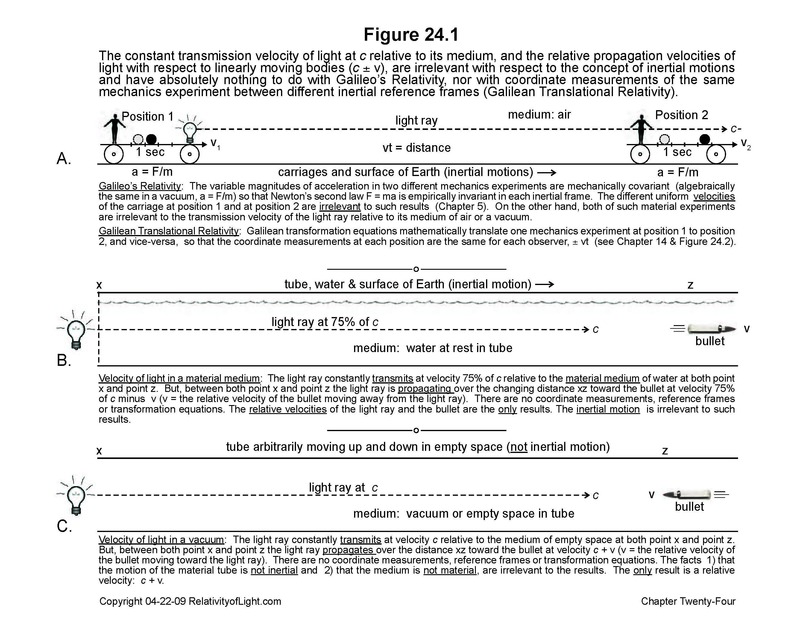 It should become obvious to the reader that material frames of reference are completely irrelevant to the transmission velocity of the light ray at c. They only confuse the analysis of what is really occurring. The serious paradox described above by Rohrlich should have been blamed on the mathematicians and their rigid material convention of always measuring the speed of anything “depending upon the [reference] frame relative to which it is measured” (Ibid, p. 52). 4. Coordinate Systems. We have already demonstrated that the material concept of coordinates is irrelevant to a ray of light, inter alia because light’s position or point of emission in space must always remain uncertain (Chapter 22B), and because there is no physical way to apply coordinates to light nor to its tremendous velocity. Not only did Einstein state that, “We must refer the process of the propagation of light…to a rigid reference body (coordinate system)” (Einstein, Relativity, p. 22), which is impossible, but he also stated that we must choose which “body of reference” (coordinate system) we desire in each “particular case” (Ibid, p. 60). Because there are infinite numbers of co-moving reference bodies in the universe which an observer on the Earth can move relative to (Chapter 10), each observer on Earth must mentally choose from an infinite number of coordinate systems (Einstein, Relativity, pp. 59 – 60). Depending upon which reference body (with a different unique velocity through space) such observer chooses, the velocity of a light ray (transmitting at c) will have a different relative velocity with respect to each different reference body. Once an observer chooses a system of coordinates with respect to a certain scenario of events that he is measuring or mathematically describing, he may change his mind. Even if the observer changes his mind and mentally chooses a different reference body (coordinate system), he will still observe the same objective scenario of events (Dingle, 1972, pp. 39 – 40). For the above reasons, Einstein’s mental choice of a body of reference (system of coordinates) with which to describe or measure the propagation of light appears to be completely contrived, impossible and meaningless. The results include total confusion and distortions of such coordinate measurements. 5. Computation of Velocities. The simple Newtonian convention for the computation of two material velocities (described in Chapter 7A) did not appear to hold when applied to the velocity of light. In Newtonian mechanics, if a fast body u and a slow body v move in the same direction, “(in fact it seems to be common sense) that the fast body will then move with a speed u – v relative to the slow body” (Rohrlich, p. 56). But, continues Rohrlich, when the fast body u is replaced by a light ray, the motion of the light ray relative to the slow body cannot be – v, because light is always found in experiments to move with the same constant velocity of c. Therefore, the velocity of the light ray relative to the slow body must also be c and not c – v (Ibid). “It is as if the difference between c and v were not c – v but were equal to c. The law for adding or subtracting speeds when the speed of light is involved is somehow not ordinary addition and subtraction” (Ibid; also see Chapter 19). What could be the answer to this paradox? This confusion by Rohrlich perfectly describes the confusion for the entire scientific community, which still remains ubiquitous in the 21st century. The answer to such paradox is as follows. Such experiments (described by Rohrlich) were all measuring the constant transmission velocity of a light ray at c over a finite distance/time interval relative to its medium of air or a vacuum. They were not measuring the varying propagation velocity of a light ray over changing distance/time intervals (ct ± vt) relative to a material body moving linearly toward or away from the light ray at v. The motion (propagation) of the light ray u relative to the slow material body v was the same as that which resulted when the Galilean transformations were misapplied to the constant transmission velocity of light with respect to different material reference frames moving linearly relative to the light ray: c ± v.
Again, the answer to such paradox is the difference between the concepts of constant transmission velocity of light relative to its medium of a vacuum and the variable relative velocity of propagation of a light ray relative to linearly moving bodies. If the mathematical physicists had not been so constrained by their rigid material conventions and had not tried to analyze the situation solely with material concepts and mathematics, they might have been able to step back and logically realize and understand what was actually happening. 6. 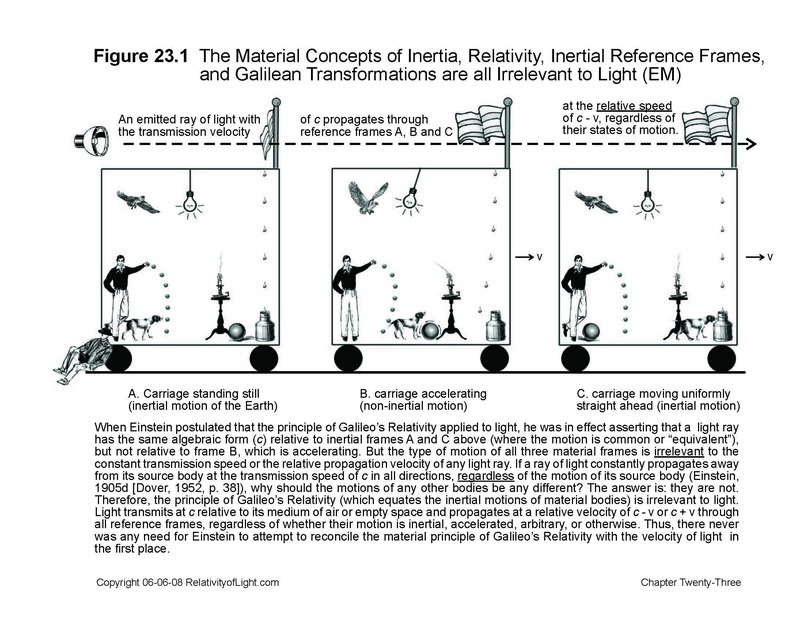 Inertial Motion & Transformation Equations. Newton’s second law of motion (F = ma) remained empirically and algebraically invariant on all inertial frames of reference, regardless of the changed covariant magnitudes of variables F, m and a. In other words, “[O]ne inertial reference frame is as good as another” with respect to mechanics (Rohrlich, p. 57). The scientific community assumed that Maxwell’s law for the constant velocity of light at c en vacuo, which had been confirmed by many experiments, should likewise remain algebraically invariant at c with respect to all inertial reference frames. In order to achieve this mathematical result, they misapplied the material and mechanics concepts of Galileo’s Relativity and the Galilean transformation equations to the constant velocity of light at c and were baffled by the paradoxical mathematical results: c – v and c + v. The equations of mechanics (i.e. F = ma) were empirically Galilean invariant, but Maxwell’s equations for light at velocity c were not. What was even more baffling was that both Newton’s and Maxwell’s equations held in the stationary frame of reference, but Maxwell’s equations did not hold in a moving frame of reference (Rohrlich, p. 57). What could be the answers to these paradoxes? The answer with respect to Galileo’s Relativity is that all inertial velocities physically simulate the same state of motion…an illusion of rest for all mechanical experiments. So, all inertial mechanics experiments share an identical sensory and empirical experience and have identical mechanical results no matter what the uniform velocity. However, such sensory and physical illusion of rest has no relevance for non-physical electromagnetic radiation and non-material light waves, or for their transmission velocity of c. On the other hand, the constant velocity of c in one inertial reference frame is very naturally a relative velocity (c ± v) in another inertial reference frame. The answer with respect to the Galilean transformation equations is that they merely translate the same mechanics experiment, its mechanical magnitudes, and its algebraic form from one inertial frame of reference to another, without any change in algebraic form or any demonstration of covariance (Chapter 14). But when the constant invariant transmission velocity of light at c in one inertial reference frame is translated to an inertial frame moving linearly and uniformly at velocity v relative to the first reference frame, there is an automatic addition or subtraction of like quantities (uniform rectilinear velocities), and the automatic mathematical result is a relative velocity of c ± v. The same mathematical result would have occurred if the constant velocity v1 of one inertial frame was translated (or compared) to the other inertial frame moving away at v2…that is, the result would be a relative velocity: v1 – v2 = v3 (Chapter 14). Two conclusions should become patently obvious to the reader: 1) one cannot meaningfully transform (translate) a constant velocity (an invariant quantity) from one reference frame to another; and 2) the material mathematical concept of transformation equations (in any form) are irrelevant, meaningless and distorting with respect to the constant transmission velocity of electromagnetic radiation (light). 7. Misinterpretation of Constant Velocities. Because the magnitudes of material phenomena (i.e. force, mass, acceleration, length, temperature, pressure, etc.) were empirically independent of their constant rectilinear velocities, the scientific community (including Einstein) apparently assumed that the velocity of light should also be independent of constant rectilinear velocities. This conclusion appeared to be logical because empirically the velocity of light was independent of the velocity of its source body (Chapter 22A). However, this assumption is not a correct conclusion for the reasons set forth in the preceding Section 6 of this chapter, and for the reasons set forth in Figure 23.2B. Why are the magnitudes of most material phenomena (such as force, mass, acceleration, length, mechanics, temperature, chemical energy, and pressure) completely independent of the inertial (constant uniform rectilinear) velocities of material bodies? One reason is because there is absolutely no logical, physical or other reason why an inertial motion or a constant velocity should change the magnitudes of such material phenomena (Figure 23.2A). There is also no empirical evidence for such theoretical velocity dependence. Another reason is because a uniform velocity and such material phenomena are completely different types of phenomena, like apples and elephants, or sounds and colors. How can one add an apple and an elephant, or loud and yellow? How can one subtract a temperature or a mass from a velocity? On the other hand, all constant uniform rectilinear velocities are exactly the same type of phenomena. 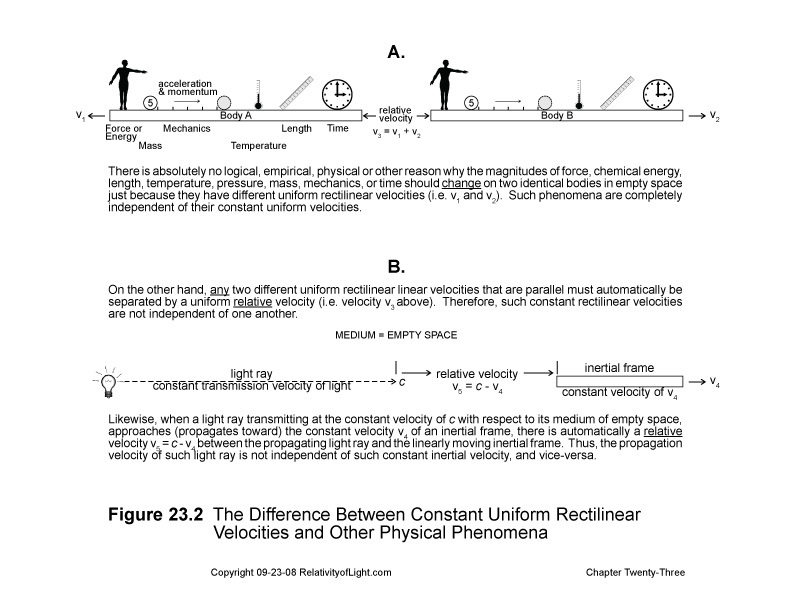 Therefore, any two different constant rectilinear velocities can be added or subtracted in order to compute a third relative velocity, whether or not we are dealing with the constant uniform velocity of a material body or the constant uniform velocity of a ray of EM radiation (i.e. light) (Figure 23.2B). This is why the constant transmission velocity of a light ray at c propagating relative to the constant inertial velocity of a linearly moving body results in a third relative velocity (c ± v) for both the body and the light ray. Thus, the constant propagation velocity of such light ray is not independent of such constant inertial velocity. 8. The Electromagnetic Wave Test for Absolute Motion. The final paradox that confronted the scientific community was perhaps the most baffling of all. If the velocity of light relative to a moving body was in fact c – v or c + v, then Michelson’s interference experiment for a light ray at c (relative to the velocity of the Earth at v) should disclose the magnitude of the Earth’s velocity (change of position) relative to the stationary ether or through empty space, as an increased distance/time interval by means of an interference (light wave phase) fringe shift (Chapter 9). But Michelson’s experiment demonstrated that the velocity of light remained a constant c in all directions, because no fringe shift was detected. This paradoxical null result, and many others like it to various orders of precision, finally caused the crisis in physics that Einstein described in Chapter 19. Such paradoxical null result needed an explanation, any explanation, even an explanation of desperation like Special Relativity. The only way to eliminate all of the above paradoxes is to properly analyze and explain the phenomenon of light and its relationships to material bodies. This is what we have attempted to do in Chapters 19, 20, 21, 22 and 23, and will continue to do in Chapter 24 and beyond. Einstein’s first postulate (his “principle of relativity”), his second postulate with respect to the absolute velocity of light at c, his Lorentz transformations, his other relativistic concepts, and his ad hoc Special Theory as a whole, are not the answers (Chapters 24 through 29).